By morning there are a few trucks with their engines running in the vehicle parking area. Overcast and leave early, as it is a long day, not sure if I can make it. Pass two large quarries, work seems to be starting with many large dump-trucks heading in the opposite direction – who are likely to be returning soon. 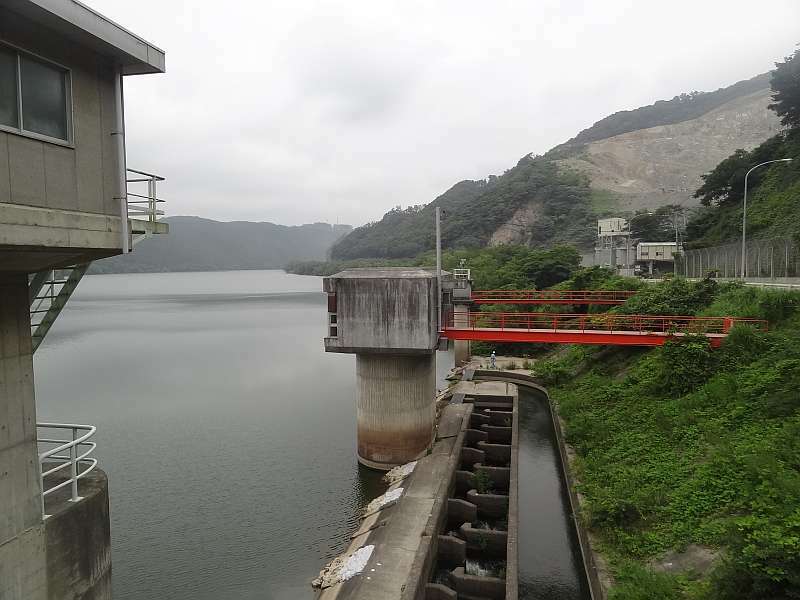 After the quarries I pass a dam, followed some time later by a shopping mall but it is too early to be open. Some men are standing at an intersection at a mall with one of them using a loud speaker. As I pass he gesters for me to stop. He put a reflector on the back wheel, I point to the front, he puts one on the front wheel as well. Thank you. Seems to be something to do with bike safety promotion. This is the start of separated foot/cycle path so relief from sharing the road with the large trucks. 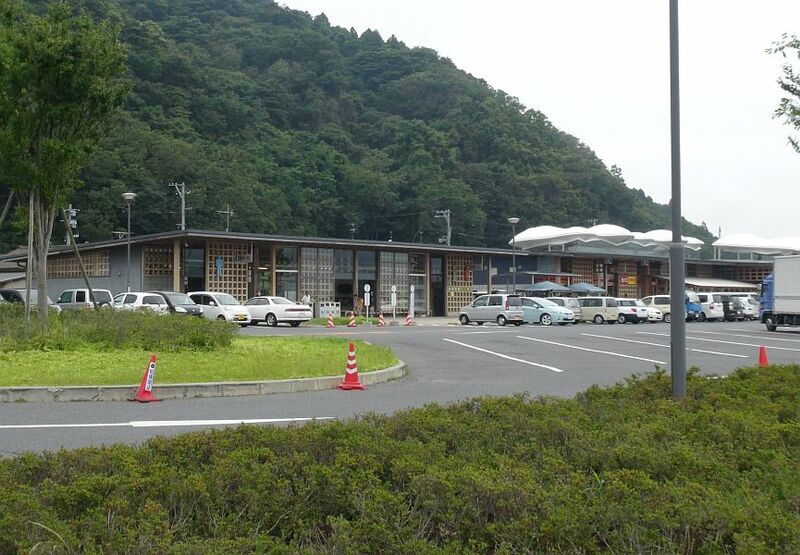 Not far down the road comes the road station/onsen I stopped at last year before heading back to Sendai. None of the people I met are here but it is still busy. There is a touring bike but can’t I see the owner. I stay about an hour but he doesn’t appear. The rest of the way should be on the route I used last year but at the turn-off to Ishinomaki City I go look, the road sign points to an information centre, so I go and soon arrive at the railway station. Ask about INJM, they phone someone and give me the handset. It is one of the INJM officials, I’m given the directions and told some volunteers should be there. 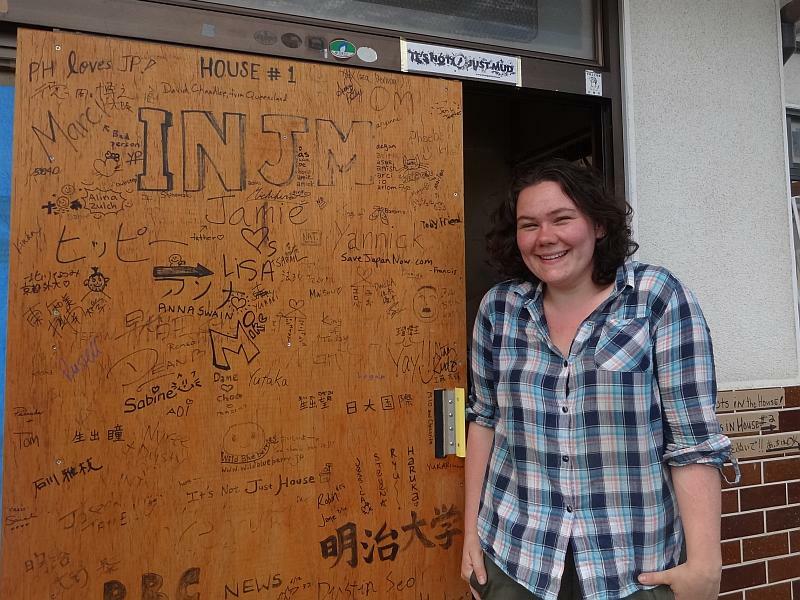 INJM is a volunteer organisation founded by Jamie, a foreign resident of Japan, to help with the recovery http://itsnotjustmud.com/. 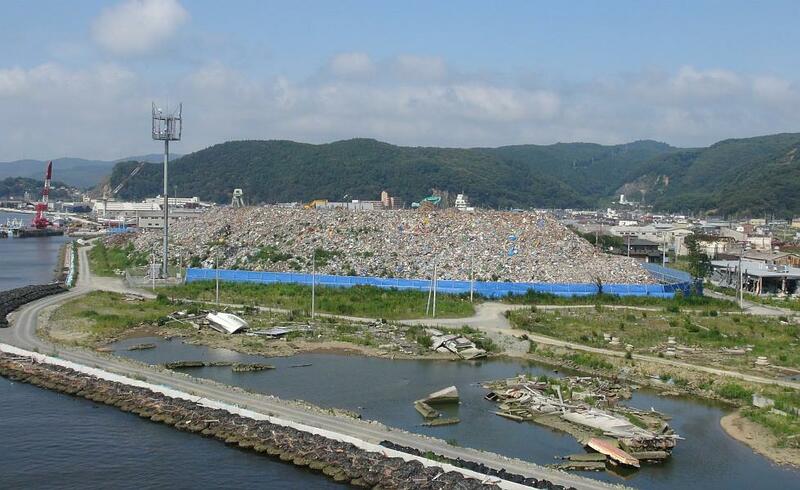 In the recent Kyushu floods they sent a team to help out with the clean-up there as well. 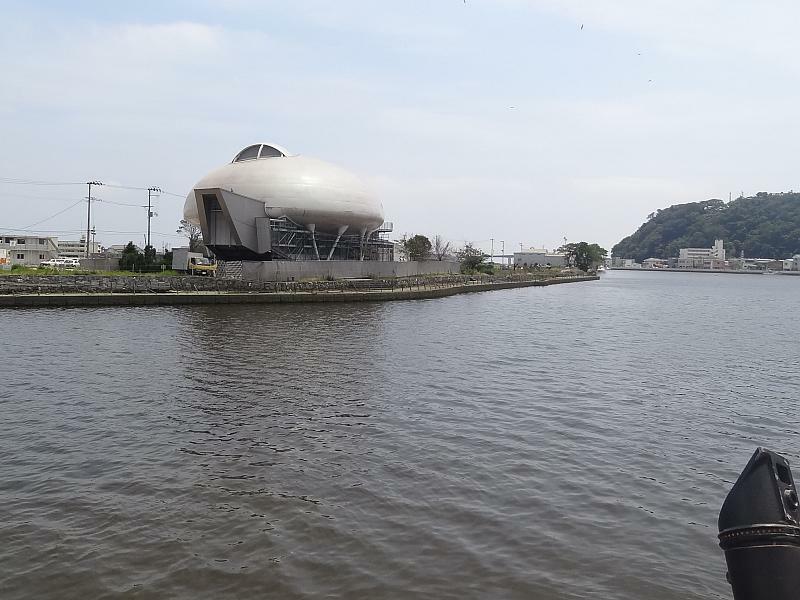 On the way Route 398 crosses Kitakami River, where there is what looks like a space ship parked by the river. 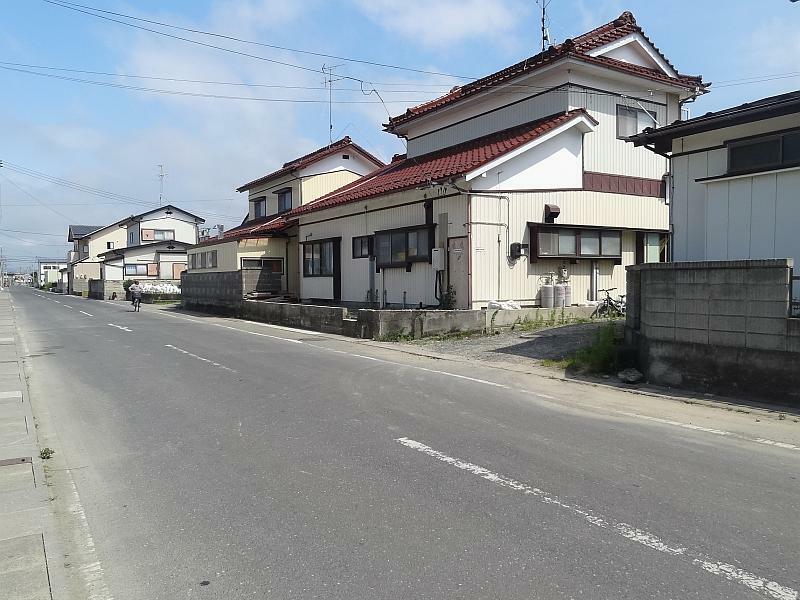 This is the Ishinomori Manga Museum, dedicated the works of Manga (comic) artist Ishinomori Shotaro. I eventually find INJM, even though the sign has been removed. An English volunteer offers me a cup of tea – what else would you get offered from an English volunteer?! We have a pleasant chat. 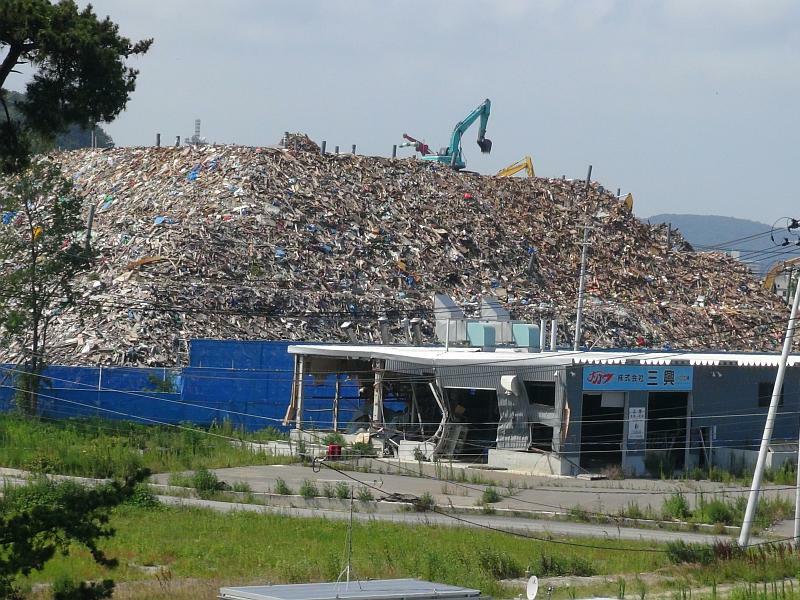 I’m offered a place to stay but tomorrow the campground at Sendai will be full and there is still enough time to get there today. 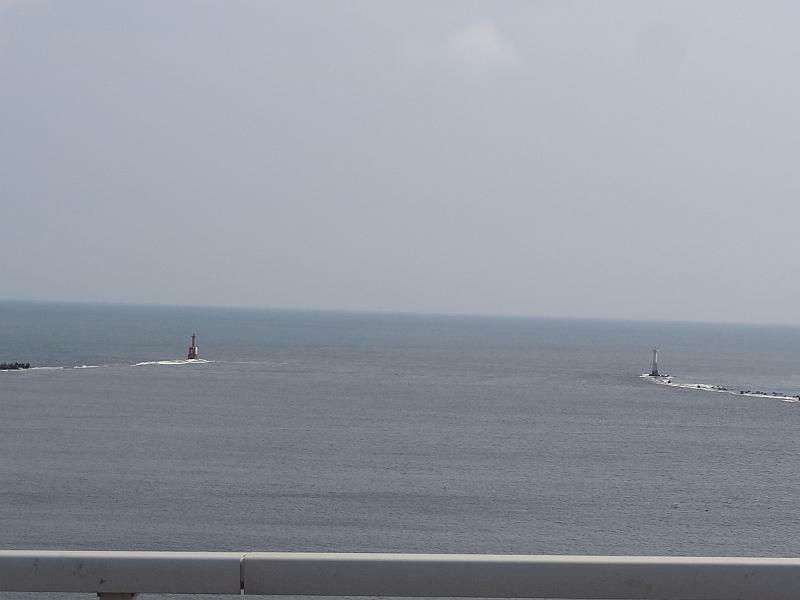 Head out of Ishinomaki on a different road. 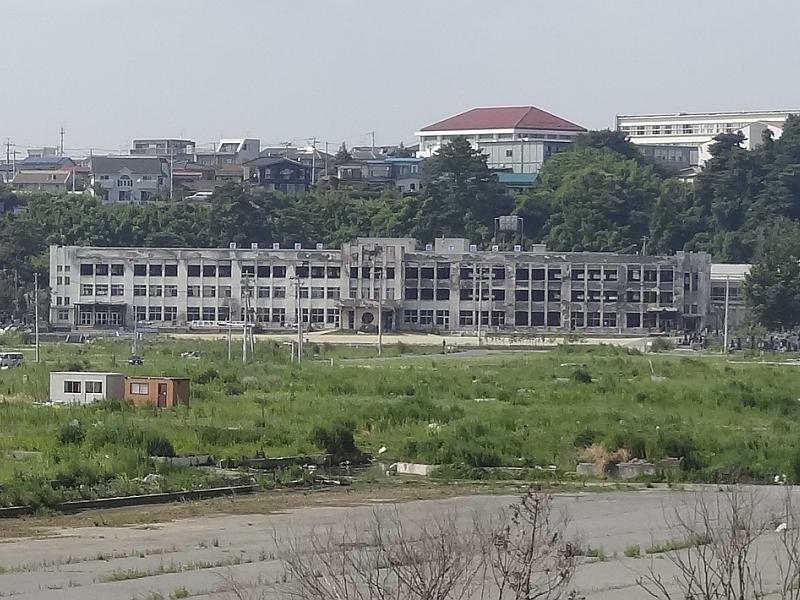 It seems to have suffered a similar fate to Kesennuma, with areas of total destruction and others with many buildings still standing, with just a damaged ground floor, and the central city still intact. It is a mostly long grind as Route 45 travels inland and back to the coast at Matsushima. Here is found one of the 3 views of Japan (日本三景 Nihon Sankei) of the canonical list of Japan’s three most celebrated scenic sights, attributed to 1643 and scholar Hayashi Gahō. 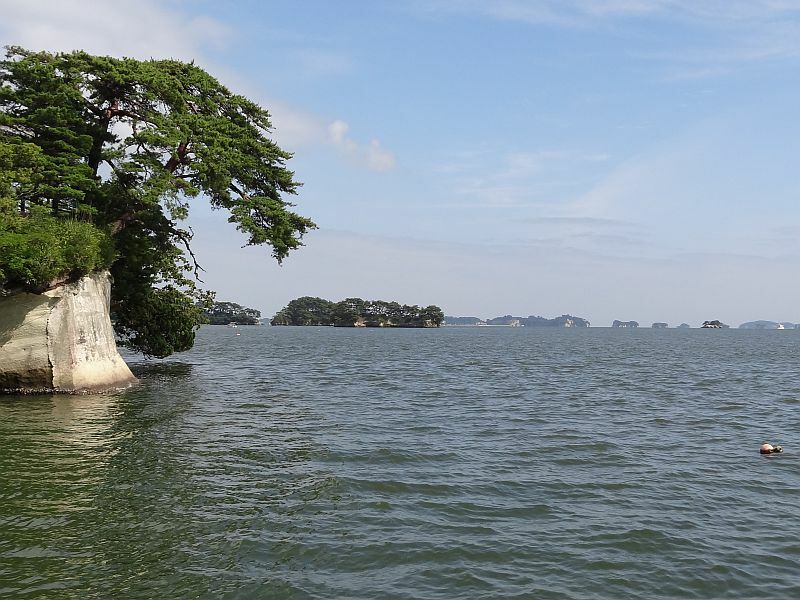 They are: Pine-clad islands of Matsushima, Sandbar of Amanohashidate and Torii at Itsukushima Shrine. See http://en.wikipedia.org/wiki/Three_Views_of_Japan for more info. There are many people here this time, clearly the crowds have returned to this tourist spot. 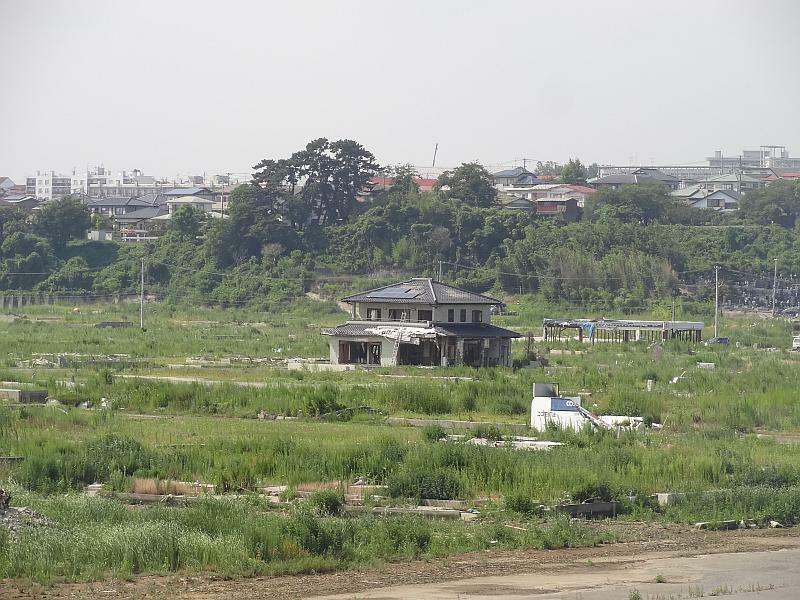 Decide to take Prefecture Road 144 that joins Prefecture Road 8 which in turn goes all the way to Sendai. 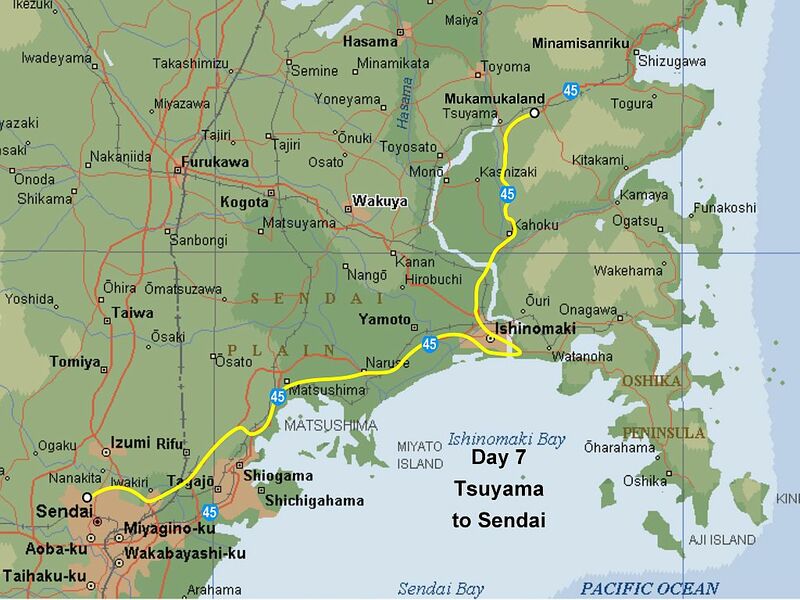 It seems a better option than Route 45, which arrives at Sendai further south. It is a mistake, it starts by climbing to the top of a very long and steep hill! I hoped it wouldn’t be busy but it is. Prefecture Road 8 does have a long descent to the outskirts of Sendai. Later join Route 4 going north-west and pass a sukiyaki restaurant. Maybe this is the last chance, so stop to eat. It’s too late to arrive before the camp office closes so no need to rush. Mostly Route 4 is the same as last year, except the turn-off road. Last year it was under construction, now it is finished. At 6 lanes it is very wide! The nearby supermarket has changed its name. 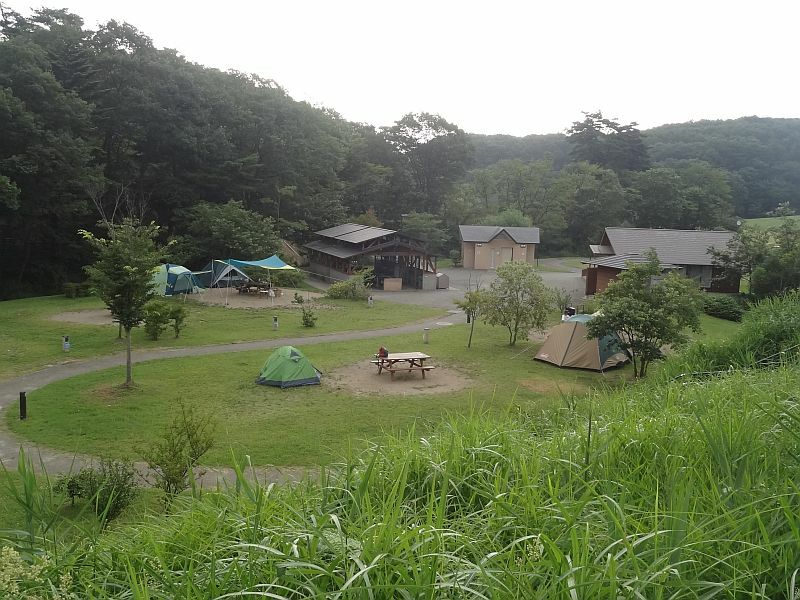 Arrive at Mizu-no-mori Campground after dark, fortunately there are several sites still available. The security guard doesn’t come. Start a conversation with other campers and put up my tent. Eventually the security guard appears and later he brings the form for me to fill out. Some people arrive very late and join people at another tent site. 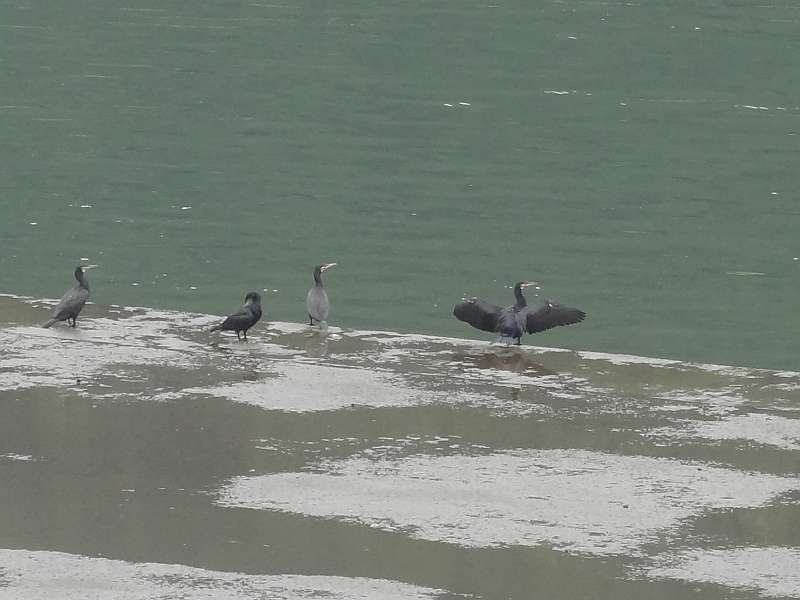 They are very jolly and make a lot of noise. I fall asleep thinking about if I should ask that they be quiet. In the morning it is warm but not hot. 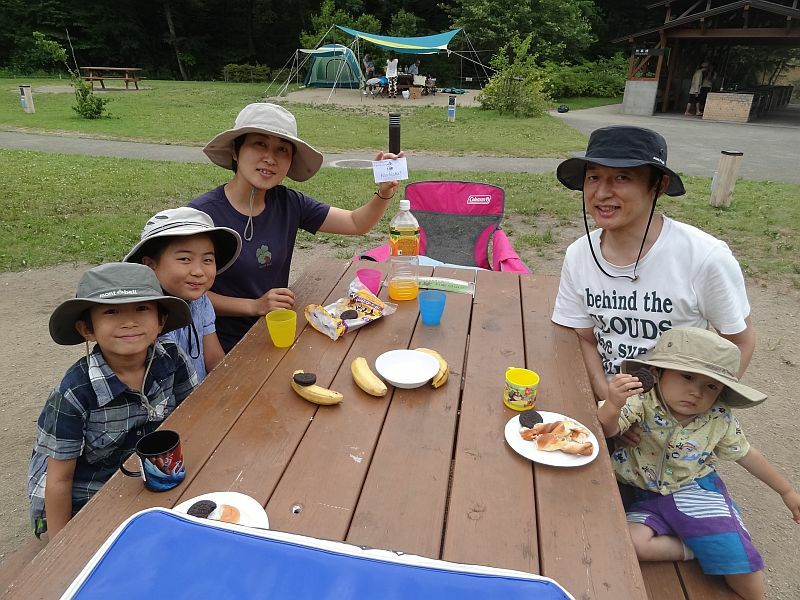 Continue the chat from last night with fellow campers Takahiro and Chisaka and their family, Mikoto, Takara and Eigo. After paying when the camp office opens in the morning I ask about Niita-san, who worked here last year. It’s his day off today, he comes to work from tomorrow but it might not be possible for me to return after today. After leaving the campground make my way to Okada. Technically the big bike ride is over. 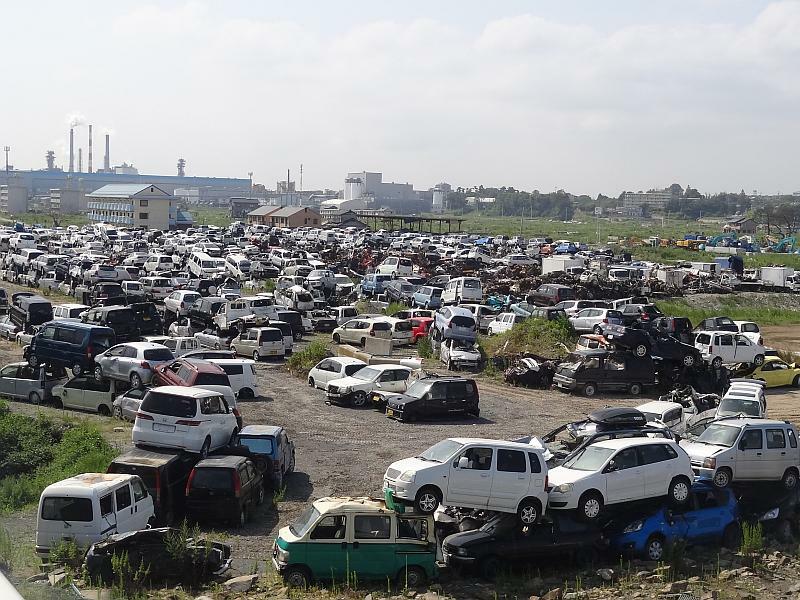 Just one more post left to do – a day in the life of a volunteer – in pictures.